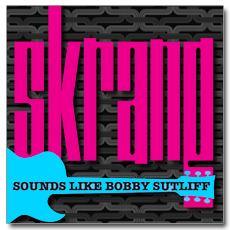 Skrang: An Excellent Tribute To Bobby Sutliff | Pop That Goes Crunch! At the time, the prognosis was guarded, albeit not particularly promising. But Bobby survived his multiple injuries, and after a month or so of sedation, he slowly began making progress. Eventually, the pace picked up, and his condition continued to improve at an amazing speed. Before long, he was back home and closing in on 100 percent recovery. But Sutliff’s un-paid medical bills were enormous. Lee thus organized ab bunch of friends to make a tribute record of Sutliff’s songs, an perform a concert in Atlanta, to raise money to defray the expenses. The resulting record, Skrang — a term coined by Sutliff to describe “the sound of an open chord on an electric guitar” — is likely one of the best things you will hear this year. It features performances by long-time purveyors of melodic rock and Power Pop, and not a single bum performance over 18 tracks. I could probably write something effusive about each of the 18 tracks on this set. Its just that good. The first-rate quality of Sutliff’s compositions shine through on each of the tracks. Even though some of the performances purposefully veer into territory that is somewhat different than the original version of the songs, the collection has an overall cohesive quality to it that makes listening from start-to-finish a joy. It’s available for $12 from Paisley Pop, and well worth every dime. All proceeds, of course, benefit Sutliff. Why does the show NOT come through iTunes or radio 365 anymore? This is depressing. I hope it is only temporary! Live 365 shut down on January 31. You can now access the station via this page — go above the title page and click on Pop That Goes Crunch Radio or click directly on the “Listen Live” headphones icon in the sidebar. Ok, I see! Wow . . . Ive been away for just a month an all that happened? Crazy. But, I found it, thank you very much! Really appreciate it. Fabulous show! Thank you! The new set-up has a lot more storage, so there will be much more variety.